Jakarta Provincial Government inaugurated Johan Romadhon as the president director of PD Dharma Jaya. He replaced Marina Ratna Dwi Kusumajati who proposed a resign letter sometime ago.
" 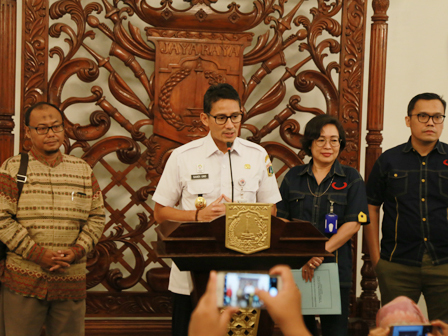 I want him still bring PD Dharma Jaya better,"
Jakarta Deputy Government, Sandiaga Uno expressed his appreciation and gratitude to Marina who has done revitalization and improvement towards PD Dharma Jaya. According to him, she has contributed greatly in maintaining stock stability and meat prices in Jakarta, suppressing inflation, and promoting the company. "Alhamdulillah (thank God), PD Dharma Jaya that had experienced ups and downs has become blue, it is profitable now," he said, during press conference about change of PD Dharma Jaya president director, at City Hall, Wednesday (5/23). Hopefully Johan could make a better future and continue to apply the concept of good corporate governance in accordance with openness, transparency, and fairness. "We want to serve the people well, supply must be secured, distribution must smooth, open and fair. We hope Mr. Johan to immediately synergize with the ranks of management and all employees in PD Dharma Jaya, including the stakeholders," he expressed. Johan is from professional circles who also served in BUMD and very familiar in terms of procurement of food sources. "Surely the city has different challenges. But, I want him still bring PD Dharma Jaya better," he stated. As for the information, Sandi also announces Muhammad Adam Ali Bhutto serves as business director of PD Dharma Jaya.